UNB Customs specializes in Trike kit sales and installation. We began converting bikes into trikes in 1998 when owner Uwe Wittkamp wanted to help his father and mother in law continue taking cross country trips from their home in Bethel, CT down to Denver, NC with the stability and comfort that a trike provides. Word of mouth and increased demand for trikes has over the years we have gone from one man in his garage to become one of the top 10 trike dealers for Roadsmith trikes. Since then we have added Hannigan Motorsports and Motor Trike to our line of conversion kits. 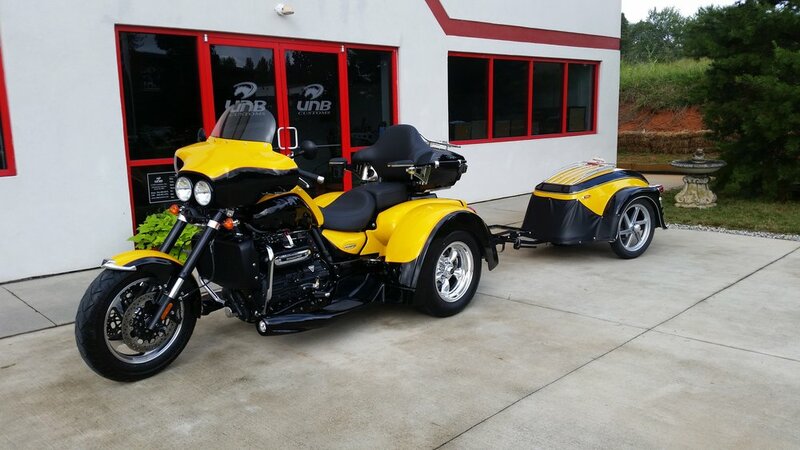 UNB Customs showroom has a few Trikes for sale and the parts and accessories you need to customize your ride. We trike all bikes with multiple manufacturers kits. Custom fabrication, paint and creations. Sidecars keep you riding in style.